The Northland Workforce Training Center is preparing the manufacturers of tomorrow. 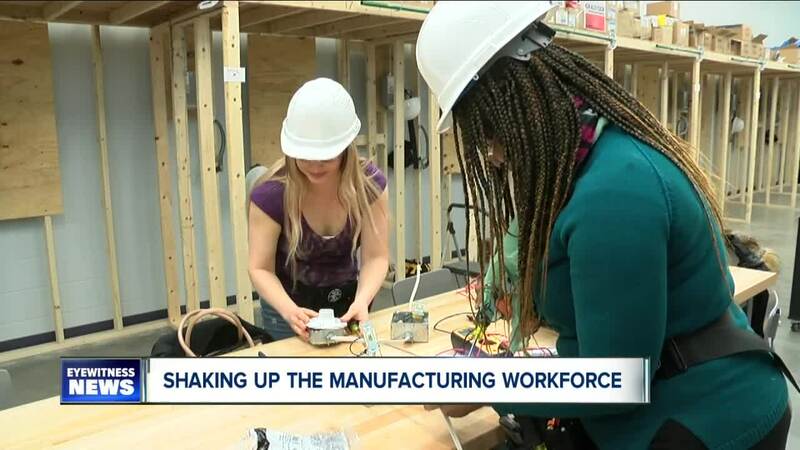 BUFFALO, N.Y. — It's not easy for women to enter an industry as male-dominated as manufacturing, but the 40 women at the Northland Workforce Training Center are taking that challenge head on. "A woman can do anything a man can do why not were mothers of the universe," Nicolle Pasiecznik, a mechatronics student, said. Northland is in its first year of operation. It's training students in fields like machining, mechatronics, and engineering. One of its goals is to enroll and graduate a diverse student body. "Currently the women representation in the manufacturing industry is less than five percent, so we have goals to help increase the diversity for women, for minorities, for veterans," Stephen Tucker, president and CEO of Northland Workforce Training Center, said. The prospect of entering a male-dominated field doesn't phase the 40 Northland women. If anything, it inspires them. "I could sit at the table with the boys. Well, yeah this is this measurement this is this diameter," Aqueelah Chamblis, a machining student, said. While all the women come from a different background, their goals are the same: to have a fresh start with better opportunities for the future. "Theres (sic) so many things I can do with this degree. So many ways I can take it. It makes me feel like I got a lot of opportunities and choices," Chamblis said. Depending on the field, Northland graduates can expect to make around $35,000 a year. That number can go up with years of experience. "Well, I'm a hardworking lady, and I would like a paycheck that finally reflects that," Pasiecznik said. For more information about Northland or enrollment for the fall semester, click this link to go to its website.